The long and winding road doesn't always lead to your door. Some roads may offer spectacular views, but the stress of driving them just ain't worth it. Here are some roads you should never try - unless you're the stunt driver in a James Bond film. 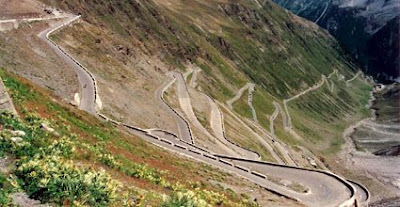 The above picture is of the Stelvio Pass, Italy (photo by Marco Mayer, sourced from Wikipedia). Located in the Italian Alps north of Bormio in the province of Sondrio, the nearby "Three languages peak" (Dreisprachenspitze) above the pass is so named because this is where the Italian, German and Romansh languages meet. The Leh-Manali Highway, India, was designed and constructed by the Indian Army and is capable of supporting their heaviest vehicles. The highway crosses some of the highest mountain passes in the world. As the journey along the road normally takes two days (or more depending on road conditions), many tourists and travellers make overnight stops at tented camps. Norway's The Trollstigen (pic by Paweł Kuźniar), which translates to The Troll Ladder in English is a popular tourist attraction due to its steep incline of 9% and eleven hairpin bends up a steep mountain side. The road up is narrow with many sharp bends, and although it has been widened in recent years, vehicles over 12.4 meters long are prohibited from driving the road. You'd be well advised to avoid these roads while in a rented motorhome -- and you'll probably find that some locations mentioned here are on the 'do not drive' list for insurance purposes. Video: Because one hairpin turn deserves another, here's some footage -- firstly from the Road of Death, Bolivia; and the second clip is from the Col de Turini -- three cars take on the mountain road between Monaco and Nice.